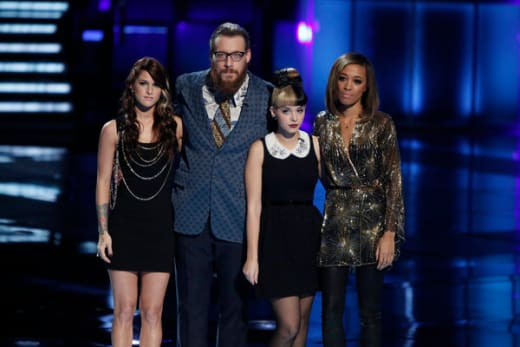 The Voice Results: Who Made the Final Four? After Monday night's Top 6 performed for America's vote, eliminations were in store for The Voice contestants once again on Tuesday. With only the best of the best still around, two more competitors were told to hit the bricks. Filled with five performances from the contestants, as well as special guests Ne-Yo and Matchbox 20, there wasn't THAT much time to get opinions from the coaches on how everything shaped up. Carson did, however, find a moment to commend Cee Lo on having pushed his button back in the Blind Auditions for every single member of the Top 10. Hold on a second. Is that really the story? Yes, he has finally put together a quality team this season, but let us not forget that he pushed his button for what seemed like everyone who came on stage back in September. If we look back, Mr. Green turned around 44 times (that we saw), recording the lowest success rate of all four coaches (36%). He may have turned around for all of the best contestants, but when you think about it, he pretty much turned for anyone who could hold a tune...and some who couldn't. In what hast to be looked at as the most talented season of finalists The Voice has seen in its three installments, two quality performers had to leave this week, and that's exactly what happened. Both Melanie and Amanda are extremely talented, but unfortunately, the other four did a little bit more to win America's love this time around. I think Ms. Martinez was done in by those ridiculous props and staging, while Amanda played everything a bit too safe on Monday. So there you have it. In the Final Four is Nicholas and Trevin from Team Cee Lo vs. Terry and Cassadee from Team Blake. I can't wait to see how it all plays out, but for now it's your turn to weight in. What did you think of America's decisions? Did we get it right?